If you only want to translate your CPT names (like Place and Places), follow the instructions here. Only the Multilingual Blog plugin is required then. But if you also want to translate the CPT slugs, you will need to keep reading below. Translate your CPT names (like Place and Places) as explained above. 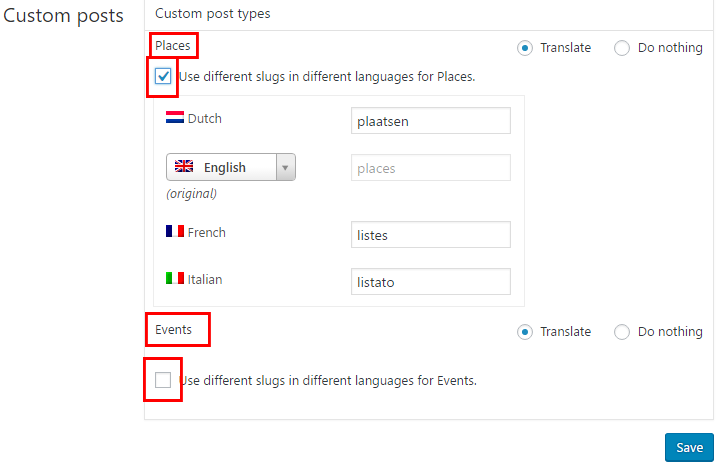 To translate your CPT slugs (like /places/ or /events/ etc), you will need WPML’s String Translation plugin, and the Translation Management plugin which are part of the Multilingual CMS plugin.